Carmel Plaza, located in Carmel-by-the-Sea on Ocean Avenue and Mission Street, is Monterey Peninsula’s premier shopping and dining destination. Visit over 35 fine stores & boutiques including Anthropologie, Bottega Veneta, Cole Haan, Tiffany & Co., Sur la Table, Kate Spade and luxurious men’s clothier, Khaki’s of Carmel. Delight in fine dining at Flying Fish Grill with its East/West fusion cuisine. For a taste of French country dishes, go to Patisserie Boissiere located in its quaint cottage setting. Come by in the morning for your warm beverage at Carmel Coffee + Cocoa Bar, open at 7:00 a.m. Sip and savor wines from any of our three notable tasting rooms. Stop by The Cheese Shop, a destination for many locals and visitors, renowned for their extensive fine cheese selection for over 35 years. Carmel Plaza is pet-friendly. For your convenience, a parking garage is available. Enter at Mission St. and 7th Avenue. 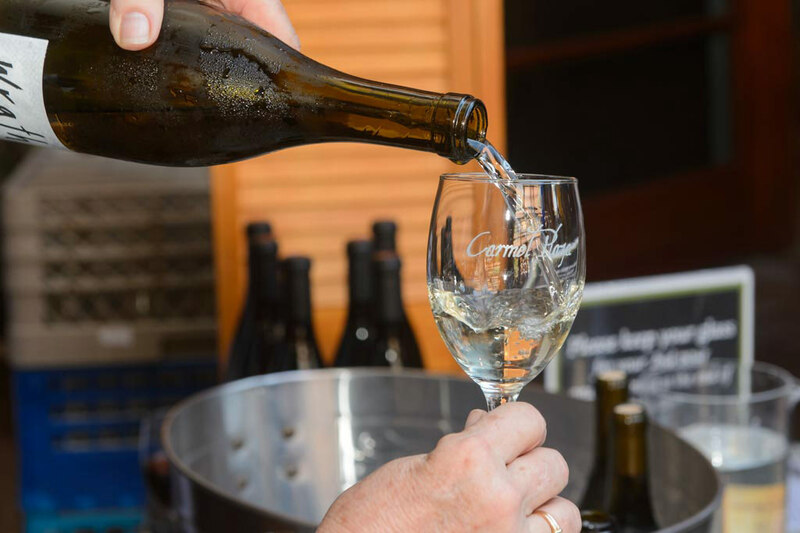 Carmel Plaza is home to three notable wine tasting rooms: Blair Estate Tasting Room, Hahn Family Wines Tasting Room, and Wrath Tasting Room, all great destinations to discover an array of California wines. If beer is what your palate is looking for visit Yeast of Eden Brewery and Restaurant that specializes in both modern and traditional elements of California cuisine and features a small, on-site brewery to produce limited batch, terroir-driven beers. In addition to our varied restaurants and shops, cooking classes will soon be available through Sur la Table at Carmel Plaza. Carmel Plaza’s three levels surround a lovely open-air courtyard, with cozy seating areas, outdoor firepits, and charming gardens. This lush setting is the perfect backdrop for our annual Summer Live Music Series.